There’s a certain irony in the fact that computer wizard Stephen Crawford never touched a keyboard until 1985 when he was in his early 30s. “I came into the industry right at the fledgling stage of the birth of the computer age,” says the owner of Crawford Computer Consulting. 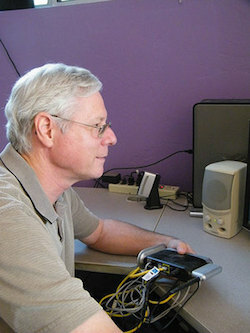 Now the former systems analyst for IBM has a stable of small business clients who rely on Crawford to get them organized and keep their computer systems working. “I see my job as rescuing people from their computers. I don’t want to be entangled in business bureaucracy — I just want to solve technical difficulties. I like to arrive at a problem site, figure out what the problem is, fix it and I’m gone — problem, solution, bam-bam-bam, and I move on,” he said. There’s been a learning curve from computer novice to Big Blue to independent contractor.